Not to be confused with Insulin. Inulins are a group of naturally occurring polysaccharides produced by many types of plants, industrially most often extracted from chicory. The inulins belong to a class of dietary fibers known as fructans. Inulin is used by some plants as a means of storing energy and is typically found in roots or rhizomes. Most plants that synthesize and store inulin do not store other forms of carbohydrate such as starch. In the United States in 2018, the Food and Drug Administration approved inulin as a dietary fiber ingredient used to improve the nutritional value of manufactured food products. Using inulin to measure kidney function is the "gold standard" for comparison with other means of estimating glomerular filtration rate. Inulin is a natural storage carbohydrate present in more than 36,000 species of plants, including wheat, onion, bananas, garlic, asparagus, Jerusalem artichoke, and chicory. For these plants, inulin is used as an energy reserve and for regulating cold resistance. Because it is soluble in water, it is osmotically active. The plants can change the osmotic potential of cells by changing the degree of polymerization of inulin molecules with hydrolysis. By changing osmotic potential without changing the total amount of carbohydrate, plants can withstand cold and drought during winter periods. Inulin was discovered in 1804 by German scientist Valentin Rose. He found “a peculiar substance” from Inula helenium roots by boiling-water extraction. The substance was named inulin because of I. helenium, but it is also called helenin, alatin, and meniantin. Indigestible polysaccharides were of great scientific concern in the beginning of the 20th century. 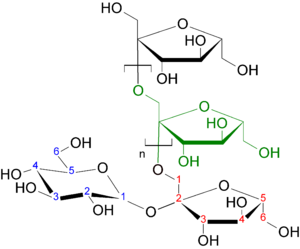 Irvine used chemical methods like methylation to study the molecular structure of inulin, and designed the isolation method for this new anhydrofructose. During studies of renal tubules in the 1930s, researchers searched for a substance that can serve as a biomarker that is not reabsorbed or secreted after introduction into tubules. Richards introduced inulin because of its high molecular weight and its resistance to enzymes. Today, inulin is used as an active ingredient for functional foods, and it is also used to determine the glomerular filtration rate. Inulin is a heterogeneous collection of fructose polymers. It consists of chain-terminating glucosyl moieties and a repetitive fructosyl moiety, which are linked by β(2,1) bonds. The degree of polymerization (DP) of standard inulin ranges from 2 to 60. After removing the fractions with DP lower than 10 during manufacturing process, the remaining product is high-performance inulin. Some articles considered the fractions with DP lower than 10 as short-chained fructo-oligosaccharides, and only called the longer-chained molecules inulin. Because of the β(2,1) linkages, inulin is not digested by enzymes in the human alimentary system, contributing to its functional properties: reduced calorie value, dietary fiber, and prebiotic effects. Without color and odor, it has little impact on sensory characteristics of food products. Oligofructose has 35% of the sweetness of sucrose, and its sweetening profile is similar to sugar. Standard inulin is slightly sweet, while high-performance inulin is not. Its solubility is higher than the classical fibers. When thoroughly mixed with liquid, inulin forms a gel and a white creamy structure, which is similar to fat. Its three-dimensional gel network, consisting of insoluble submicron crystalline inulin particles, immobilizes large amount of water, assuring its physical stability. It can also improve the stability of foams and emulsions. Chicory root is the main source of extraction for commercial production of inulin. The extraction process for inulin is similar to obtaining sugar from sugar beets. After harvest, the chicory roots are sliced and washed, then soaked in a solvent; the inulin is then isolated, purified, and spray dried. Inulin may also be synthesized from sucrose. Inulin received no-objection status as generally recognized as safe (GRAS) from the US Food and Drug Administration (FDA), including long-chain inulin as GRAS. In the early 21st century, the use of inulin in processed foods was due in part to its adaptable characteristics for manufacturing. It is approved by the FDA as an ingredient to enhance the dietary fiber value of manufactured foods. Its flavor ranges from bland to subtly sweet (about 10% of the sweetness of sugar/sucrose). It can be used to replace sugar, fat, and flour. This is advantageous because inulin contains 25-35% of the food energy of carbohydrates (starch, sugar). In addition to being a versatile ingredient, inulin provides nutritional advantages by increasing calcium absorption and possibly magnesium absorption, while promoting the growth of intestinal bacteria. Chicory inulin is reported to increase absorption of calcium in young women with lower calcium absorption and in young men. In terms of nutrition, it is considered a form of soluble fiber and is sometimes categorized as a prebiotic. Conversely, it is also considered a FODMAP, a class of carbohydrates which are rapidly fermented in the colon producing gas and drawing water into the colon. Although FODMAPs can cause certain digestive discomfort in some people, they produce potentially favorable alterations in the intestinal flora that contribute to maintaining health of the colon. Due to the body's limited ability to process fructans, inulin has minimal increasing impact on blood sugar, and may potentially have use in managing blood sugar-related illnesses, such as metabolic syndrome. Inulin and its analog sinistrin are used to help measure kidney function by determining the glomerular filtration rate (GFR), which is the volume of fluid filtered from the renal (kidney) glomerular capillaries into the Bowman's capsule per unit time. Inulin is of particular use as it is not secreted or reabsorbed in any appreciable amount at the nephron, allowing GFR to be calculated. However, due to clinical limitations, inulin and sinistrin, although characterised by better handling features, are rarely used for this purpose and creatinine values are the standard for determining an approximate GFR. Inulin enhances the growth and activities of bacteria or inhibits growth or activities of certain pathogenic bacteria. A 2017 systematic review of clinical trial results showed that dietary supplementation with inulin reduced biomarkers of metabolic syndrome. Anaphylactic allergic reaction (rare) - inulin is used for GFR testing, and in some isolated cases has resulted in an allergic reaction, possibly linked to a food allergy response. Nonhydrolyzed inulin can also be directly converted to ethanol in a simultaneous saccharification and fermentation process, which may have potential for converting crops high in inulin into ethanol for fuel. Inulins are polymers composed mainly of fructose units (fructans), and typically have a terminal glucose. The fructose units in inulins are joined by a β(2→1) glycosidic bond. In general, plant inulins contain between 20 and several thousand fructose units. Smaller compounds are called fructo-oligosaccharides, the simplest being 1-kestose, which has two fructose units and one glucose unit. Inulins with a terminal glucose are known as alpha-D-glucopyranosyl-[beta-D-fructofuranosyl](n-1)-D-fructofuranosides, abbreviated as GpyFn. Inulins without glucose are beta-D-fructopyranosyl-[D-fructofuranosyl](n-1)-D-fructofuranosides, abbreviated as FpyFn. Hydrolysis of inulins may yield fructo-oligosaccharides, which are oligomers with a degree of polymerization) of 10 or less. Inulin is uniquely treated by nephrons in that it is completely filtered at the glomerulus but neither secreted nor reabsorbed by the tubules. This property of inulin allows the clearance of inulin to be used clinically as a highly accurate measure of glomerular filtration rate (GFR) — the rate of plasma from the afferent arteriole that is filtered into Bowman's capsule measured in ml/min. It is informative to contrast the properties of inulin with those of para-aminohippuric acid (PAH). PAH is partially filtered from plasma at the glomerulus and not reabsorbed by the tubules, in a manner identical to inulin. PAH is different from inulin in that the fraction of PAH that bypasses the glomerulus and enters the nephron's tubular cells (via the peritubular capillaries) is completely secreted. Renal clearance of PAH is thus useful in calculation of renal plasma flow (RPF), which empirically is (1-hematocrit) times renal blood flow. Of note, the clearance of PAH is reflective only of RPF to portions of the kidney that deal with urine formation, and, thus, underestimates the actual RPF by about 10%. The measurement of GFR by inulin or sinistrin is still considered the gold standard. However, it has now been largely replaced by other, simpler measures that are approximations of GFR. These measures, which involve clearance of such substrates as EDTA, iohexol, cystatin C, 125I-iothalamate (sodium radioiothalamate), the chromium radioisotope 51Cr (chelated with EDTA), and creatinine, have had their utility confirmed in large cohorts of patients with chronic kidney disease. Inulin is indigestible by the human enzymes ptyalin and amylase, which are adapted to digest starch. As a result, it passes through much of the digestive system intact. Only in the colon do bacteria metabolise inulin, with the release of significant quantities of carbon dioxide, hydrogen, and/or methane. Inulin-containing foods can be rather gassy, in particular for those unaccustomed to inulin, and these foods should be consumed in moderation at first. Inulin is a soluble fiber, one of three types of dietary fiber including soluble, insoluble, and resistant starch. Soluble fiber dissolves in water to form a gelatinous material. Some soluble fibers may help lower blood cholesterol and glucose levels. Because normal digestion does not break inulin down into monosaccharides, it does not elevate blood sugar levels and may, therefore, be helpful in the management of diabetes. Inulin also stimulates the growth of bacteria in the gut. Inulin passes through the stomach and duodenum undigested and is highly available to the gut bacterial flora. This makes it similar to resistant starches and other fermentable carbohydrates. Some traditional diets contain over 20 g per day of inulin or fructo-oligosaccharides. The diet of the prehistoric hunter-forager in the Chihuahuan Desert has been estimated to include 135 g per day of inulin-type fructans. Many foods naturally high in inulin or fructo-oligosaccharides, such as chicory, garlic, and leek, have been seen as "stimulants of good health" for centuries. Due to its resistance to digestive enzymes, inulin resists absorption during its transit through the upper gastrointestinal tract. After reaching the large intestine, inulin is converted by colonic bacteria to a gel known as a prebiotic, a food ingredient that is highly nourishing to gut microflora. As of 2013, no regulatory authority had permitted health claims in the marketing of prebiotics as a class. Inulin's health effects had been studied in small clinical trials, which showed that it causes gastrointestinal adverse effects such as bloating and flatulence, does not affect triglyceride levels or development of fatty liver, may help prevent traveler’s diarrhea, and may help increase calcium absorption in adolescents. ^ a b Roberfroid, M. B. (2003). "Introducing inulin-type fructans". Br. J. Nutr. 93: 13–26. doi:10.1079/bjn20041350. PMID 15877886. ^ Roberfroid MB (2007). "Inulin-type fructans: functional food ingredients". Journal of Nutrition. 137 (11 suppl): 2493S–2502S. doi:10.1093/jn/137.11.2493S. PMID 17951492. ^ a b "The Declaration of Certain Isolated or Synthetic Non-Digestible Carbohydrates as Dietary Fiber on Nutrition and Supplement Facts Labels: Guidance for Industry" (PDF). US Food and Drug Administration. 14 June 2018. Retrieved 15 June 2018. ^ Hsu, CY; Bansal, N (August 2011). "Measured GFR as "gold standard"--all that glitters is not gold?". Clinical Journal of the American Society of Nephrology. 6 (8): 1813–4. doi:10.2215/cjn.06040611. PMID 21784836. ^ a b c d e Niness, KR (July 1999). "Inulin and oligofructose: what are they?". The Journal of Nutrition. 129 (7 Suppl): 1402S–6S. doi:10.1093/jn/129.7.1402S. PMID 10395607. ^ a b c d Kalyani Nair, K.; Kharb, Suman; Thompkinson, D. K. (18 March 2010). "Inulin Dietary Fiber with Functional and Health Attributes—A Review". Food Reviews International. 26 (2): 189–203. doi:10.1080/87559121003590664. ^ a b c Boeckner, LS; Schnepf, MI; Tungland, BC (2001). Inulin: a review of nutritional and health implications. Advances in Food and Nutrition Research. 43. pp. 1–63. doi:10.1016/s1043-4526(01)43002-6. ISBN 9780120164431. PMID 11285681. ^ a b Irvine, James Colquhoun; Soutar, Charles William (1920). "CLXV. The constitution of polysaccharides. Part II. The conversion of cellulose into glucose". Journal of the Chemical Society, Transactions. 117: 1489–1500. doi:10.1039/CT9201701489. ^ Irvine, James Colquhoun; Stevenson, John Whiteford (July 1929). "The molecular structure of inulin. Isolation of a new anhydrofructose". Journal of the American Chemical Society. 51 (7): 2197–2203. doi:10.1021/ja01382a035. ^ a b Richards, A. N.; Westfall, B. B.; Bott, P. A. (1 October 1934). "Renal Excretion of Inulin, Creatinine and Xylose in Normal Dogs". Experimental Biology and Medicine. 32 (1): 73–75. doi:10.3181/00379727-32-7564P. ^ Shannon, JA; Smith, HW (July 1935). "The excretion of inulin, xylose and urea by normal and phlorinzinized man". The Journal of Clinical Investigation. 14 (4): 393–401. doi:10.1172/JCI100690. PMC 424694. PMID 16694313. ^ Coulthard, MG; Ruddock, V (February 1983). "Validation of inulin as a marker for glomerular filtration in preterm babies". Kidney International. 23 (2): 407–9. doi:10.1038/ki.1983.34. PMID 6842964. ^ Barclay, Thomas, et al. Inulin-a versatile polysaccharide with multiple pharmaceutical and food chemical uses. Diss. International Pharmaceutical Excipients Council, 2010. ^ Franck, A. (9 March 2007). "Technological functionality of inulin and oligofructose". British Journal of Nutrition. 87 (S2): S287. doi:10.1079/BJN/2002550. ^ Rulis, Alan M (5 May 2003). "Agency Response Letter GRAS Notice No. GRN 000118". US Food and Drug Administration. ^ Keefe, Dennis M (9 December 2015). "Agency Response Letter GRAS Notice No. GRN 000576". US Food and Drug Administration. ^ a b c d e Slavin, Joanne (2013-04-22). "Fiber and Prebiotics: Mechanisms and Health Benefits". Nutrients. 5 (4): 1417–1435. doi:10.3390/nu5041417. ISSN 2072-6643. PMC 3705355. PMID 23609775. ^ Roberfroid, MB (1999). "Caloric value of inulin and oligofructose". J Nutr. 129 (7 Suppl): 1436S–7S. doi:10.1093/jn/129.7.1436S. PMID 10395615. ^ "Caloric Value of Inulin and Oligofructose"
^ Abrams S, Griffin I, Hawthorne K, Liang L, Gunn S, Darlington G, Ellis K (2005). "A combination of prebiotic short- and long-chain inulin-type fructans enhances calcium absorption and bone mineralization in young adolescents". Am J Clin Nutr. 82 (2): 471–6. doi:10.1093/ajcn.82.2.471. PMID 16087995. ^ Griffin, I. J.; P. M. . Hicks; R. P. Heaney; S. A. Abrams (2003). "Enriched chicory inulin increases calcium absorption mainly in girls with lower calcium absorption". Nutr. Res. 23 (7): 901–909. doi:10.1016/s0271-5317(03)00085-x. ^ Makharia A, Catassi C, Makharia GK (2015). "The Overlap between Irritable Bowel Syndrome and Non-Celiac Gluten Sensitivity: A Clinical Dilemma". Nutrients (Review). 7 (12): 10417–26. doi:10.3390/nu7125541. PMC 4690093. PMID 26690475. ^ Greer JB, O'Keefe SJ (2011). "Microbial induction of immunity, inflammation, and cancer". Front Physiol (Review). 1: 168. doi:10.3389/fphys.2010.00168. PMC 3059938. PMID 21423403. ^ a b Liu, F; Prabhakar, M; Ju, J; Long, H; Zhou, H. W (2017). "Effect of inulin-type fructans on blood lipid profile and glucose level: A systematic review and meta-analysis of randomized controlled trials". European Journal of Clinical Nutrition. 71 (1): 9–20. doi:10.1038/ejcn.2016.156. PMID 27623982. ^ Essentials of Human Physiology by Thomas M. Nosek. Section 7/7ch04/7ch04p11. - "Glomerular Filtration Rate"
^ Saad, N.; C. Delattre; M. Urdaci; J. M. Schmitter; P. Bressollier (2013). "An overview of the last advances in probiotic and prebiotic field". LWT - Food Sci. Technol. 50: 1–16. doi:10.1016/j.lwt.2012.05.014. ^ Coussement, Paul AA (1999). "Inulin and oligofructose: safe intakes and legal status". The Journal of Nutrition. 129 (7): 1412S–1417S. doi:10.1093/jn/129.7.1412S. PMID 10395609. ^ Bacchetta, Justine (2008). "'Renal hypersensitivity' to inulin and IgA nephropathy". Pediatric Nephrology. 23 (10): 1883–1885. doi:10.1007/s00467-008-0819-9. PMID 18535847. Retrieved July 5, 2013. ^ Kazuyoshi Ohta; Shigeyuki Hamada; Toyohiko Nakamura (1992). "Production of High Concentrations of Ethanol from Inulin by Simultaneous Saccharification and Fermentation Using Aspergillus niger and Saccharomyces cerevisiae". Applied and Environmental Microbiology. 59 (3): 729–733. PMC 202182. PMID 8481000. ^ Costanzo, Linda. Physiology, 4th Edition. Philadelphia: Lippincott Williams and Wilkins, 2007. Page 156-160. ^ Leach, JD; Sobolik, KD (2010). "High dietary intake of prebiotic inulin-type fructans in the prehistoric Chihuahuan Desert". Br J Nutr. 103 (11): 1558–61. doi:10.1017/S0007114510000966. PMID 20416127.